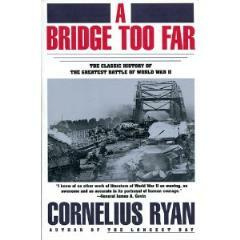 A Bridge Too Far is Cornelius Ryan's masterly chronicle of the Battle of Arnhem, which marshalled the greatest armada of troop-carrying aircraft ever assembled and cost the Allies nearly twice as many casualties as D-Day. In this compelling work of history, Ryan narrates the Allied effort to end the war in Europe in 1944 by dropping the combined airborne forces of the American and British armies behind German lines to capture the crucial bridge across the Rhine at Arnhem. Focusing on a vast cast of characters -- from Dutch civilians to British and American strategists to common soldiers and commanders -- Ryan brings to life one of the most daring and ill-fated operations of the war. A Bridge Too Far superbly recreates the terror and suspense, the heroism and tragedy of this epic operation, which ended in bitter defeat for the Allies.